Q1. In a certain code, BASIC is written as DDULE. How is LEADER written in that code? Q2. In a certain code language, BORN is written as APQON and LACK is written as KBBLK. How will the word GRID be written in that code language? Q3. If DEER = 12215 and HIGH = 5645, how will you code HEEL? Q4. If DRIVER = 12, PEDESTRIAN = 20, ACCIDENT = 16, then CAR = ? Q5. If ‘bat’ is ‘racket’, ‘racket’ is ‘football’, ‘football’ is ‘shuttle’, ‘shuttle’ is ‘ludo’ and ‘ludo’ is ‘carrom’, what is cricket played with? Q6. If ‘man’ is called ‘girl’, ‘girl’ is called ‘woman’, ‘woman’ is called ‘boy’, ‘boy is called ‘butler’ and ‘butler’ is called ‘rogue’, who will serve in a restaurant? Circle C stands for households having a car. The different numbers indicate the non-overlapping regions e.g. S represents union of regions 1, 11, 12, 8, 9, 10 and 6. Sol. Clearly, each letter is coded by a numeral which is 3 less than the numeral denoting the position of the letter in the English alphabet. The code for the word is obtained by joining together physically the number codes for the individual letters. H, E, L are 8th, 5th and 12th letters respectively. So, their codes are 5, 2 and 9 respectively. Thus, the code for HEEL becomes 5229. Sol. Clearly, each word is coded by the numeral which is twice the number of letters in the word. So, CAR = (Number of letter in CAR) × 2 = 3 × 2 = 6. Sol. Cricket is played with a ‘bat’ and ‘bat’ is called ‘racket’. So, cricket is played with a ‘racket’. Sol. A ‘butler’ serves in a restaurant but ‘butler’ is called ‘rogue’. So, a ‘rogue’ will serve in the restaurant. Sol. 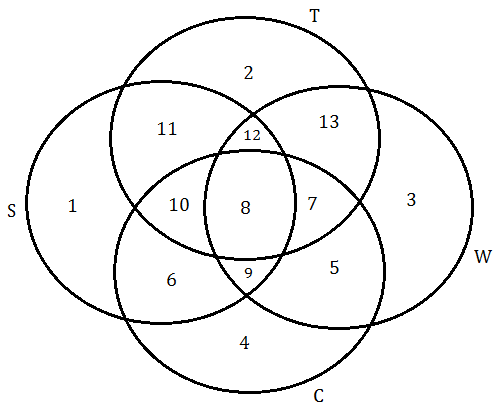 The required region is the one which is common to all the four circles i.e. 8. Sol. 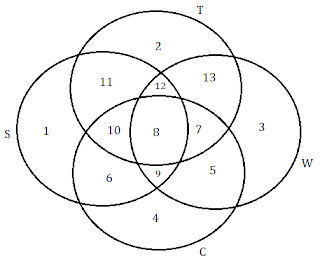 The required region is the one which lies inside circle S but outside circles T, W and C i.e. 1. Sol. The required region is the one which lies inside circle C but outside circle W i.e. 6, 10 and 4. Sol. The required region is the one which is common to circles S, T and W but lies outside circle C i.e. 12.